Parts of North Texas are in a moderate drought. 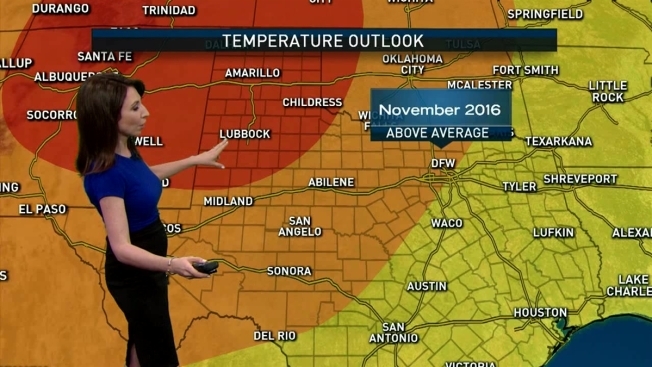 October 2016 was the warmest on record for North Texas, with the average temperature being 74.1 — 6.6 degrees above normal. The previous record of 73.5 was set back in 1963. This year, the warmest temperature was 94 on Oct. 5, the coldest was 51 the morning of Oct. 22. October 2016 was also very dry. At Dallas/Fort Worth International Airport, a total of 2.01 inches of rain fell. That is 2.21 inches below normal. Because of this, parts of North Texas are in a moderate drought. What does November 2016 have in store? It'll be warm. The Climate Prediction Center's Temperature Outlook has Texas receiving above normal temperatures, but the precipitation forecast could go either way. CPC has North Texas at an equal chance of above or below normal precipitation. Based on long range forecast and recent trends, I wouldn't be surprised it November is below normal for precipitation too.